Ray and I joined some friends for a getaway last Thursday through Saturday. 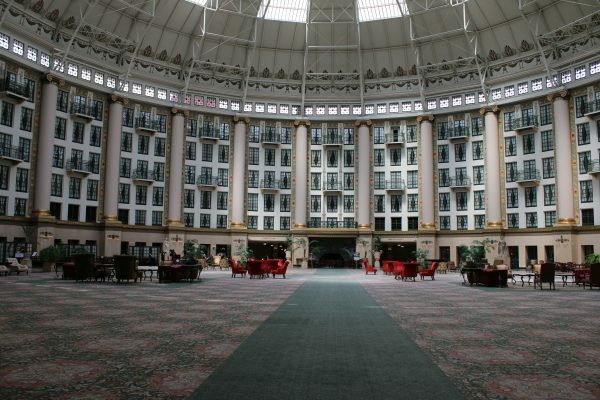 Many years ago they had stumbled upon a broken down resort hotel in southern Indiana. 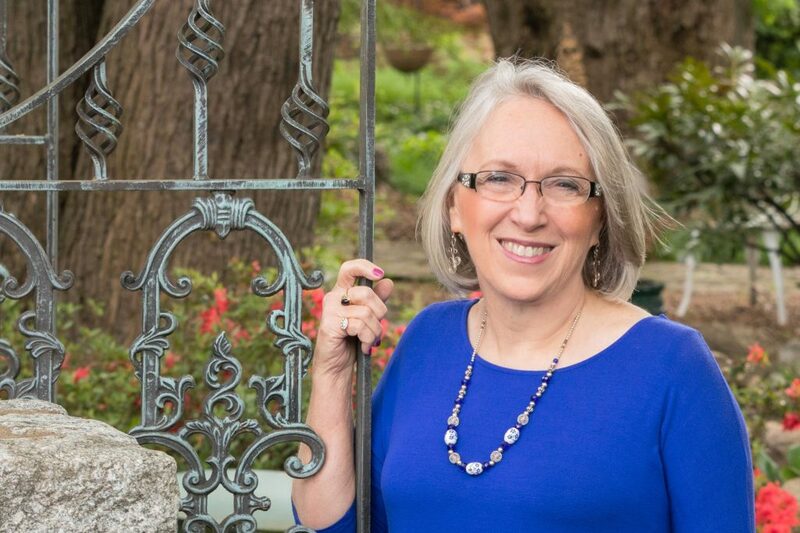 The place had obviously been grand at one time; but, as they and their homeschooled children explored it back then, there was a clear danger that debris could fall on their heads. 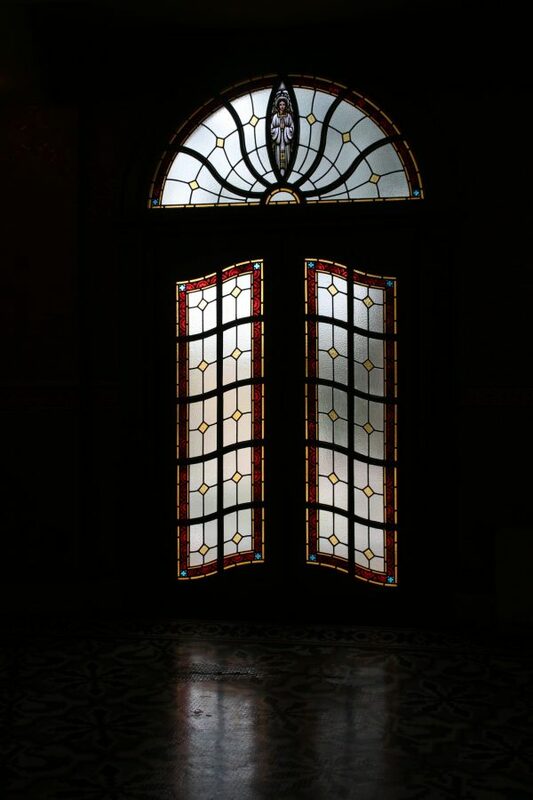 A few years later, they returned and found the place no longer falling apart but beautifully restored and oozing with stories from the past. They knew we would enjoy the beauty and the stories, so they invited us to join them for a getaway. We checked into a chain hotel on Thursday evening and spent all day Friday exploring the beautiful (and expensive) French Lick Hotel . . .
. . . and nearby West Baden Springs Hotel (where our friends feared falling debris many years ago) in the twin cities of French Lick and West Baden, Indiana. West Baden Hotel in West Baden, Indiana. 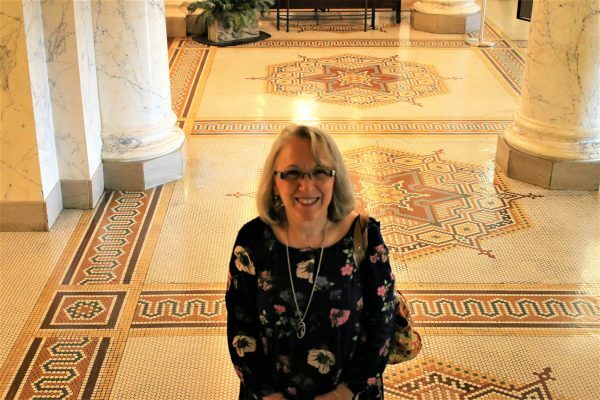 The interiors of the French Lick Hotel were beautiful, including the hand-laid mosaic tile floor in the lobby . . .
. . . and this second floor balcony overlooking the lobby. 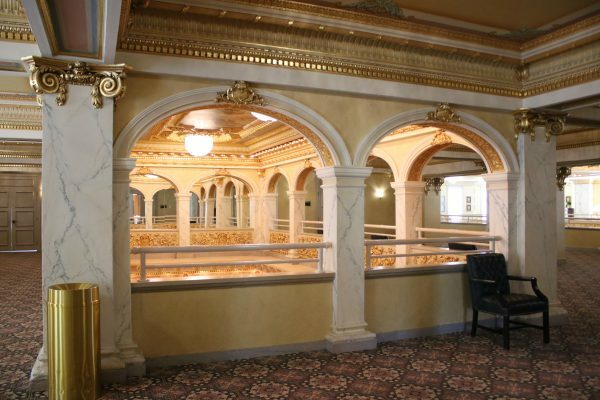 Row upon row of portraits of famous people who have visited the French Lick Hotel are on display, including actors, singing stars, Helen Keller, President Harry Truman, Vice President Mike Pence, and many more. A governors conference at the French Lick Hotel in 1931 helped Franklin Roosevelt become the Democratic candidate for president in 1932. 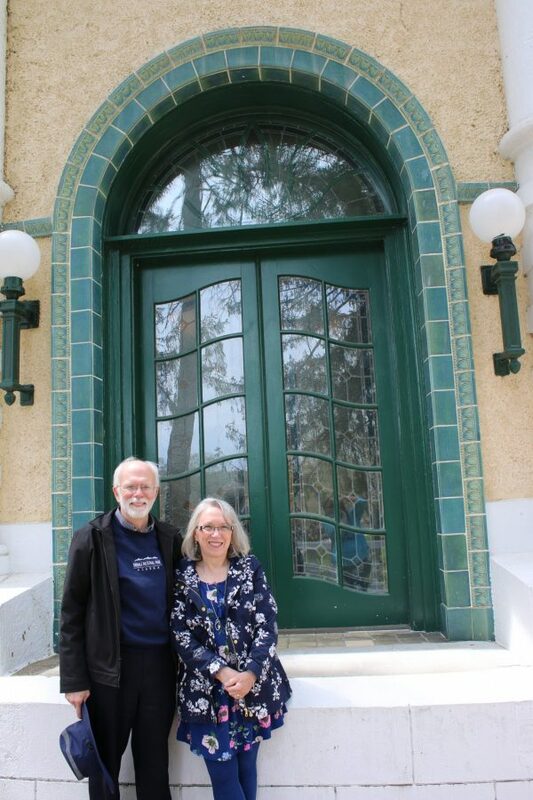 When we got to the West Baden Hotel, we took some pictures outside. 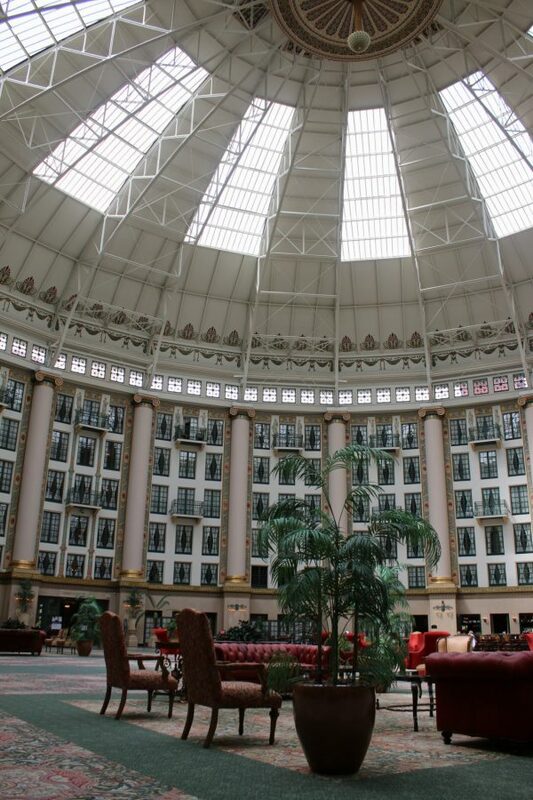 Our friends saved the best for last and actually took a video of our faces as we saw the interior of the West Baden Hotel for the first time. 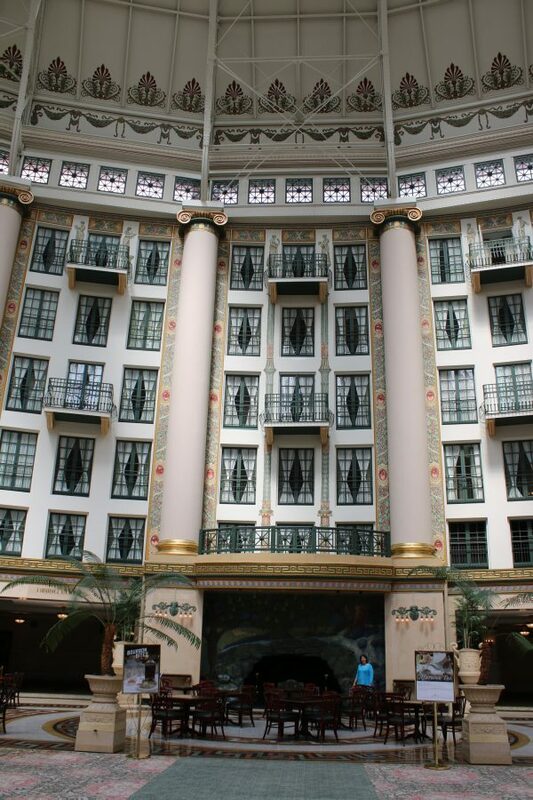 I was impressed by the lobby, . . .
. . . but the atrium was spectacular. It was the world’s largest free-standing dome when it was completed. Here is a photo from 1900. 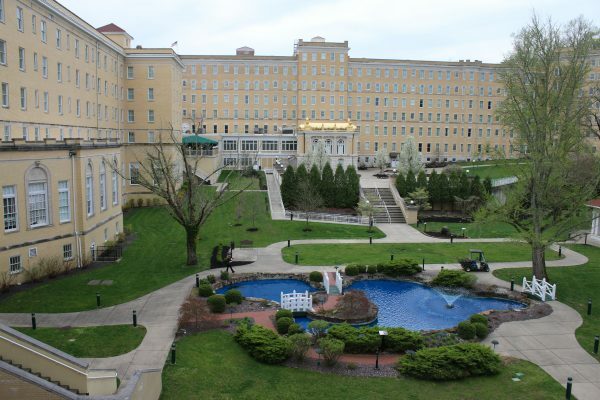 For nine months, beginning in October of 1918, the hotel served as a convalescent home for recovering American soldiers who had fought in World War I. Circuses once wintered in the area. 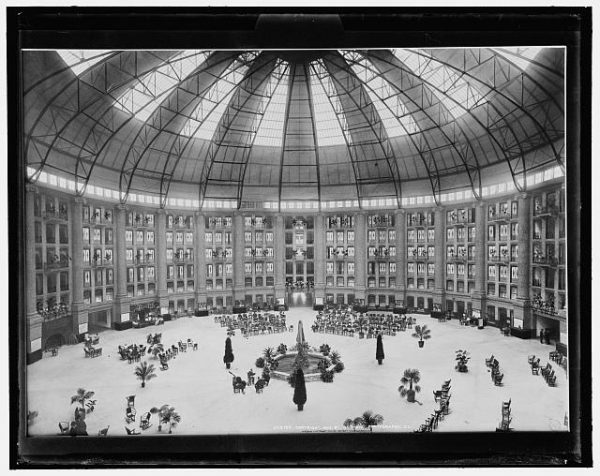 We saw a wonderful picture of the atrium on Christmas Day in 1918 when the hotel owner invited a wintering circus to set up a tent on one side of the atrium so that the soldiers could enjoy a performance. Here’s what the atrium looks like today. Five levels of guest rooms surround it. The dome rises high above them. Find my friend Terry beside the fireplace in this picture to see the enormity of this free-standing space, built over a century ago. 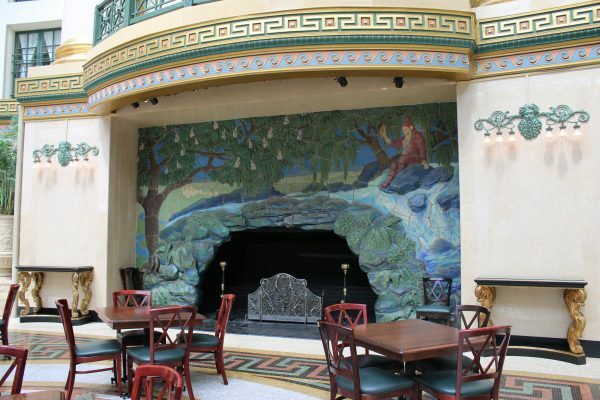 Here is a closer look at that fireplace. Promises of miracle healing mineral springs began drawing tourists to this “middle of nowhere” location before the Civil War. 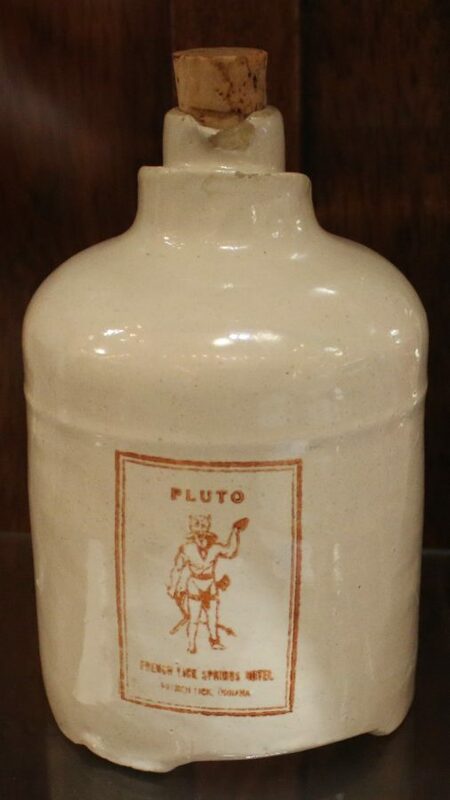 The character on the bottle is Pluto, whom the Greeks believed to be ruler of the underworld. He became the symbol because the mineral spring waters came from under ground. Casinos soon followed. 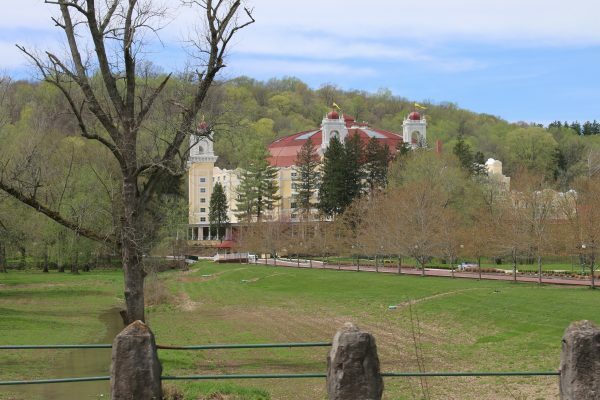 The FDA curtailed the claims of miracle healing mineral waters in the 1970s, but the casino at the French Lick Hotel draws visitors to the area again today. We didn’t participate in the casino, but we enjoyed the beauty and history very much. 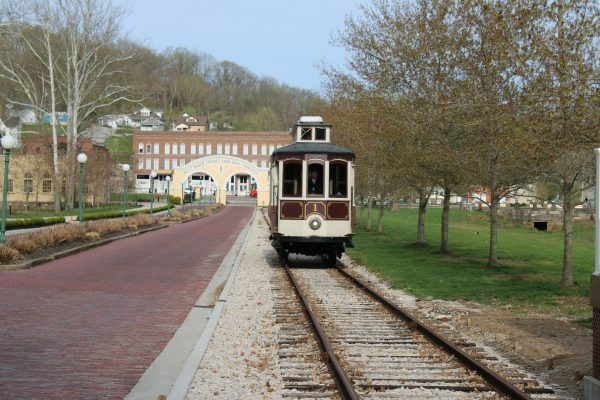 As we began our day of exploration on Friday, we parked near the French Lick Hotel and took advantage of the free trolley to travel between the hotels. During the day on Friday, we rode the trolley with a mama and her energetic and well-behaved little girls. Seeing them out on a Friday, I asked if they homeschooled. She told me that they were there with her husband who was attending a conference for medical professionals. She said that she didn’t homeschool but that she thought it was okay to take her children out of school for the day. She said that her oldest daughter had special needs and that outings taught her more vocabulary than she learned in school. Hmmm . . . I thought. Learning more on an outing than in school . . . There’s a lesson there, don’t you think? I know I quote this passage often, but it really goes to the heart of what you are doing! Good job, Mama! Absolutely amazing!! What a treasure! And definitely qualifies as field trip credit!! I think I could enjoy a stay there!! Will add that to my “want to do” list!! Beautiful hotels. Looks similar to something that can be found on the strip in Vegas. A very small town just over from where I live had the “miracle water” long ago. Actually it just had a lot of sulphur in it and smelled really bad. They were forced to shut down that claim as well but got much attention and visitors to the town square where there was a free fountain for many years. Thank you for taking us on this visual tour.